Dale Minner, die-hard Clemson dad, traveled to Tanzania in October 2018 to dig wells for remote villages. He traveled with Ken Wood, whose charity Lifetime Wells International has dug almost 2,000 wells in Ghana and Tanzania. Learn more at www.lifetimewellsinternational.org. They say it takes a village ­— and for one town in Ghana that couldn’t be truer. Over the past decade, the people of Okurase have been working together to transform their community for a more prosperous future by constructing the Nkabom Centre, the area’s first-ever educational facility. The 18,000-square-foot structure has electricity and running water and is the first of a 17-building complex completely designed by Clemson architecture students studying at the Clemson Design Center in Charleston (CDC.C). Cynthia Swenson, a professor with the Medical University of South Carolina, approached the CDCC for help in 2008. As the co-founder of Project Okurase, a nonprofit that develops sustainable, replicable solutions for disadvantaged villages, Swenson had been working in the Okurase community for several years and following the vision of the community, wanted to help construct a complex that would house educational and medical facilities with water and energy. But money was limited. The trip provided another valuable lesson: The buildings needed to be constructed with compressed earth bricks. “To allow the community to play an active role and become invested in building their own community, everything we designed was built around local craftsmanship and skills we saw on our trip to Ghana,” Keaffaber said. However, the on-loan brick-making machine had to be returned before work was completed. 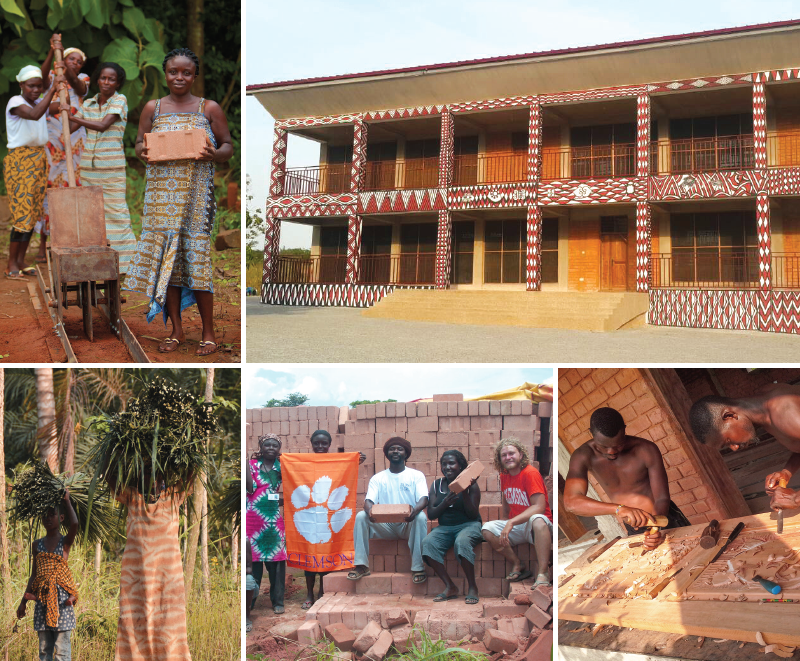 Clemson faculty and staff stepped in and built four manual brick-making machines. Today, the first structure in the complex stands tall, awaiting students of all ages to take their seats in the coming weeks, and now the community eagerly anticipates construction of the next building. I took my Tiger Rag to the top of the highest freestanding mountain in the world……9 days later, Dabo Swinney said that after Clemson won the national championship! Erin Grubbs ’13 climbing to the top of Mount Kilimanjaro during Christmas break 2014.